I could not believe my Puck, not only was I having breakfast with the effervescent Jonty but I was having breakfast at CUT at 45 Park Lane. 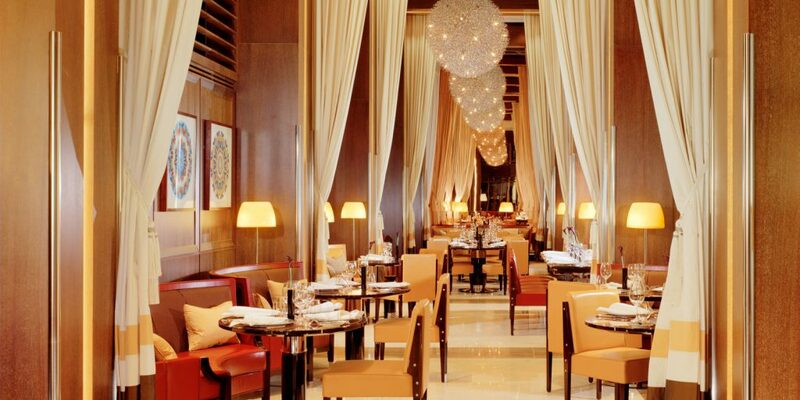 The Dorchester Collection’s ninth hotel, it opened on 1st September 2011 with Wolfgang Puck’s first venture in Europe. 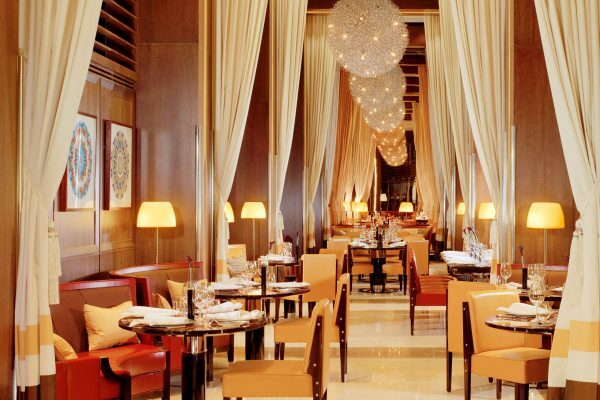 CUT at 45 Park Lane, a modern American steak restaurant which mirrors the award-winning original CUT Beverly Hills offering fabulous steaks, a tempting wine list, perfect service and now breakfast for non-residents of the hotel. The restaurant occupies the ground floor with seating for 70 guests, an intimate affair perfect for breakfast with friends or for business, and today I was there for both. I am not known for being a morning person, being somewhat of a night owl and girl about town, but breakfast at CUT by one of my favourite international chefs was too tempting to pass up, even at nine o’clock in the morning. Having been cocktailing at The Sanderson the night before I was in a bit of a daze on my way to Park Lane, what kept me going was the thought of freshly brewed coffee and a hearty breakfast. When I arrived Jonty was already at the table, engrossed in the morning paper and sipping tea; I slumped in to the plump leather booth and ordered that much needed coffee before tackling the decision as to what to eat. 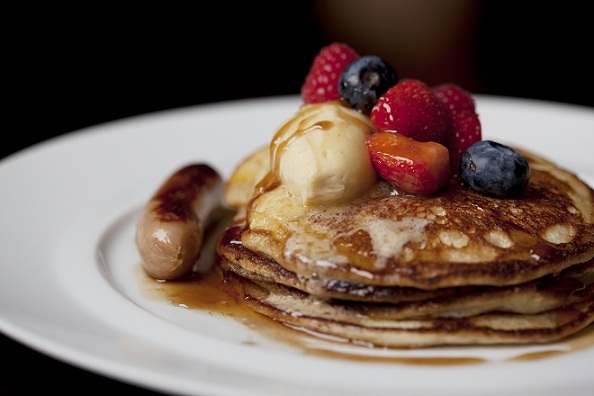 The breakfast menu at CUT is of epic proportion with a whole plethora of delights on offer, from traditional breakfast items to American classics to lighter options (these were promptly skipped past). The attentive waiter came over to take our orders; Jonty battled with his want of salt beef hash cakes but instead opted for the two fried organic eggs, creamy parmesan polenta, sage butter, maple glazed pork belly and toasted brioche. When it comes to breakfast there is only one option for me if on the menu and that is pancakes, so true to form I ordered the buttermilk pancakes with maple whipped butter and added streaky bacon. I also ordered a side of scrambled eggs, not something I eat that often but I find eggs show the quality of a breakfast establishment, they can be done well or they can be horridly rubbery. Top ups of the coffee and tea are bought over and Jonty and I get down to the business of catching up having not seen each other since the wet and windy night at St Martins Lane Hotel. After a good gossip the breakfast arrives, as one can imagine with an American restaurant the portions were far from meagre. Jonty’s plate was more of a platter, piled high with breakfast goodies, the smell of the pork wafted over to my side of the table making me even more ravenous for my bacon. Maybe not your typical conventional breakfast choice but the filling combination of the pork with polenta and toasted brioche meant lunch would not be required. My pancakes were chunky and stacked in a neat pile crowned with the whipped maple butter, the bacon was placed elegantly on the side in a criss-cross pattern, and if that was not enough I had a maple syrup and scrambled eggs on the side. In cavalier fashion, I poured the maple syrup over, well, everything. The pancakes soaked in the sticky sweet nectar so as I bite in the creamy fluffy pancakes they ooze with syrup. The bacon was crispy and salty cutting through the sweetness of the maple; the eggs were cooked to perfection, slightly runny and golden in colour. This was indeed an indulgent breakfast. After washing down this gluttonous feast with even more coffee, it was time to try and move from the booth, not an easy feet at that point for either of us. I was grateful that my journey was a short one; next door to the comfort of The Dorchester Spa it so happened, where I could lie for hours, like a snake digesting an antelope. 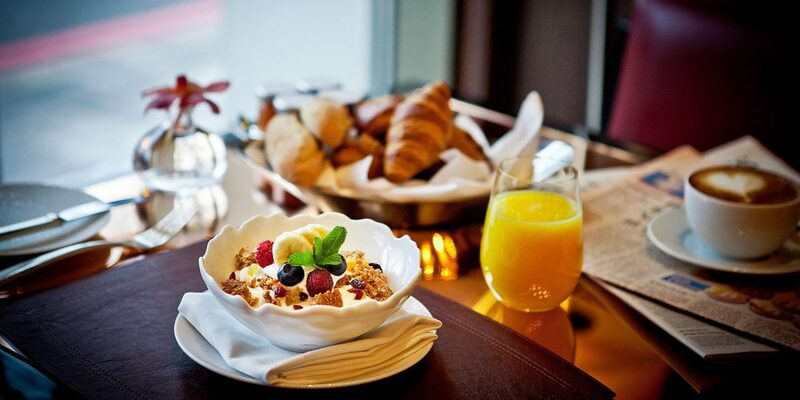 Breakfast at CUT at 45 Park Lane is not for the faint hearted, unless you cop out and hit the granola. 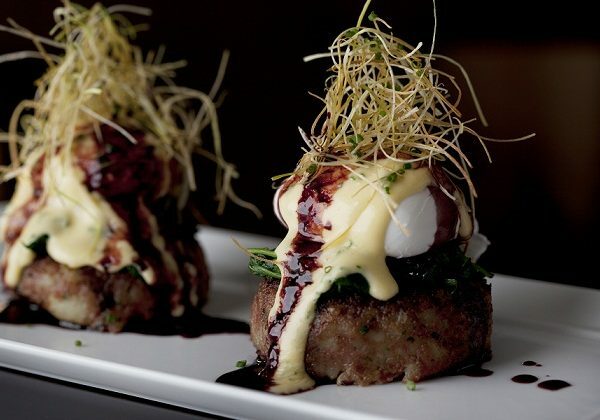 With such a wonderful selection on offer for breakfast, including some timeless American classics, this steakhouse has indeed more to offer than wagyu and wine: a truly Pucking sensational breakfast.